Cool pocket knife with fantasy dragon handle. The everyday carry knife is an assisted opening knife. Dragon assisted opening knife for sale on wholesale knives price. The pocket knife is a folding knife with dragon embossed printed on aluminum handle. The open length of the knife is 7.75 inches long. 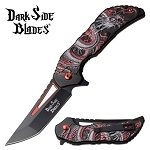 Black 3cr13 steel blade with Dark Side Blades logo. Includes pocket clip.